Please join the MCMG for our annual plant sale. Come early for the best selection 8:00 am to 12 Noon. Reasonable prices on locally grown items; Plants; flowers, veggies, herbs, shrubs, vines, bulbs, and much more! Create your own flower arrangement for your mother, wife or special loved one or we can create one for you, min charge. Booths with garden related items and a children’s activity. Come show your support. Garden related items will be sold as well. We will be offering a Basic Hypertufa DIY Hands on Workshop to make a garden pot. The cost is $15.00 offered at 8:30, 9:30 and 10:30 am sign up on line at shelby6866@yahoo.com. You can also sign up for the MCMG Courses being offered. This event is sponsored by the Maury County Parks and Recreation. 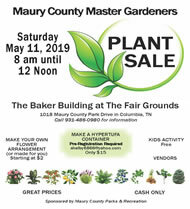 For more information please call 931-486-0980 or find us on Facebook at Maury County Master Gardeners. Check out some photos from the May 2018 Plant Sale. Check out some photos from the May 2017 Plant Sale. How Can I Become a Master Gardener? Volunteers must attend 40 hours of training offered by the UT Extension. Classes meet twice a week for 6 weeks. The sessions cover a wide variety of topics including wildlife, landscaping, flowers, trees, lawns, insects, plant diseases, and more. After completing the training the volunteer becomes an Intern for a year. To become a “Certified Master Gardener,” an Intern must complete and document a minimum of 40 hours of volunteer gardening related service and 8 hours of continuing education. The 2019 Master Gardener class graduated Thursday, April 4, 2019. "How Do I Become A Master Gardener"